Grow Your Business With Your Own Branded Mobile App. How about having your branded app? We are not just talking about colours and logo changes, but an entirely new app, with your name, your logo, and images, your colours, products and your very own app listing on Google Play store and the Apple App store. Statistics show that the average person spends at least two hours on his or her mobile device every day. While probably only a handful of applications make up the bulk of this total usage, it doesn’t change the fact that each user has to unlock, scroll, and scan their device for the apps they’re looking for. Apps serve many functions: they can provide general info, prices, booking forms, search features, product listings, news feeds, and much more. Alert customers to promotions, events and offers by sending push notifications whenever you want, as often as you want. What better way to increase repeat business and alert people of special limited time only offers. Have access to social media feeds directly within the app to create a social buzz around your products and services. Allow your customers to view your key businesses offerings. The best place to showcase your portfolio. Increase business revenue and let your customers make bookings and reservations with a few simple taps. Make your customers sticky by enticing them to come back for loyalty rewards and offers. Appy Customer is the complete customer engagement tool for your business. Here at Genesis Business Systems we have been developing apps for businesses since 2009. We wanted to create an easy to use engagement tool for you to be able to connect with your customers. Customer retention can be enhanced through a mobile app by providing your customers with a convenient method of engaging with you through an easy to use interface. A mobile app for your business will allow you to market directly to your customer base and give them instant access to your social media, products and services. Our completely free push messaging system will keep your customers up to date with your latest offers and news (and give your business a serious competitive edge). 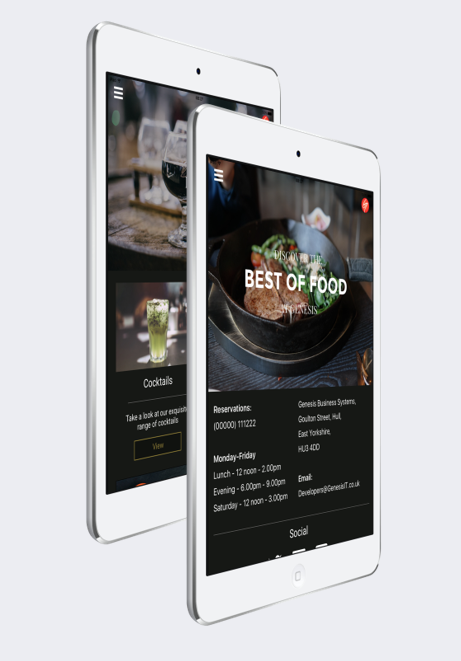 The app is completely customisable, offering you the option to add your logo, change colours, content and links at any time through an easy to use online content management system. A mobile app for your business can greatly contribute to your brand awareness. Be the first in your area to offer a mobile app to your customers. They’ll be astonished by your forward-thinking approach!